12.0 Megapixels for stunning prints as large as 16 x 20 inches. 4x Wide-angle Zoom-NIKKOR Glass Lens has a versatile zoom range from wide 27mm to 108mm telephoto coverage that gets you close to your subject while capturing expansive landscapes. Beautiful, Bright 3.0-inch High Resolution TOUCH PANEL HVGA (460,000-dot) Clear Colour Display with anti-glare coating that enables easy touch control to all camera functions. Sensitive Response Touch Panel display enables effortless use of touch panel by ensuring sensitive response to even the lightest tapping and touch for smooth operation. Touch Shutter and Autofocus simply tap the LCD to have the camera focus and even shoot the picture. Retouch and Draw functions for quick, convenient in-camera enhancements and personalization to any image. New HD Movie Record stunning HD (720p) quality movies at 30fps for easy playback in camera, on TV or computer. Electronic VR Image Stabilization minimizes the effect of camera shake. Motion Detection automatically detects moving subjects and adjusts shutter speed and ISO setting to compensate for camera shake and subject movement. Nikon’s original Best Shot Selector (BSS) automatically takes up to 10 shots while the shutter is pressed and saves the sharpest image. Slim, Stylish, Metal Design in a variety of stunning colours for pocketable convenience and individuality. In-Camera Red-Eye Fix automatically fixes, while shooting, most instances of red-eye in the camera. You may never see red-eye again. Face-Priority AF Nikon’s face-finding technology that automatically focuses on up to 12 faces. Skin Softening smoothes skin tone at three different levels for optimal portraits. EXPEED Image Processing ensures high-quality pictures with stunning colour and sharpness. 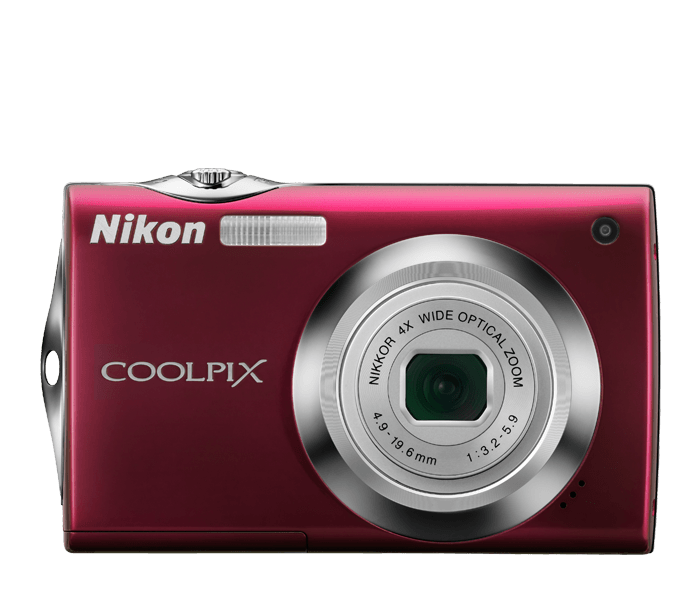 Nikon’s comprehensive digital imaging processing concept incorporates the know-how and technologies accumulated throughout our long history of photographic and digital imaging development and is custom-tuned for COOLPIX. Applied optimized technologies render natural-looking pictures of incredible quality and quick response so you won’t miss that special moment. Subject Tracking will automatically track a moving subject to ensure sharp focus. Quick Retouch optimizes contrast and colour vividness for beautiful images. Scene Auto Selector automatically recognizes the scene in your picture and adjusts camera setting. D-Lighting rescues dark or backlit images by improving brightness and detail during playback. 16 Scene Modes for optimized shooting in various settings. Macro shooting as close as 3.1”. 5 Colour Options for special filter effects. Choose from: standard colour, vivid colour, black-and-white, sepia and cyanotype.